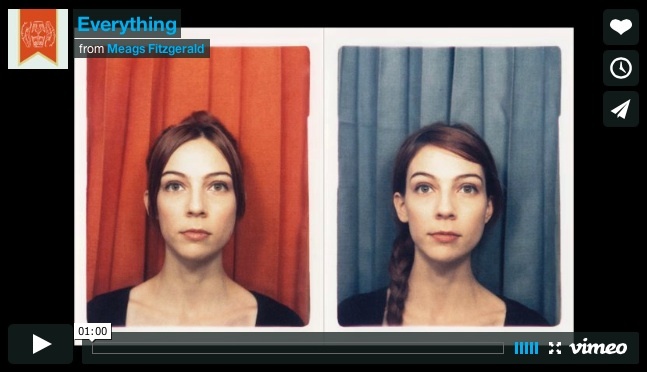 Artist and photobooth lover Meags Fitzgerald recently released a new stop motion animation that she made in a photobooth in Canada last November. Her artistry with the booth as her creative tool is very inspiring and quite wonderful. You can view it on her blog by clicking here or by going directly to Vimeo. If you visit Meags’s blog, you will be able to explore it for more posts about her involvement with all things photobooth. There are some fabulous things to be found there. I will soon be posting more about Meags as she has a new photobooth inspired book soon to be released around the world. A must buy for photobooth fans! Kat, I cannot get that video to play. It should, yes? Hi Mike. Only if you click on the link. If you click on the photo it won’t work. Maybe I need to rethinking the screen grab? Hey, thanks for the enthusiasm! Your stuff is pretty fierce. Thanks Mark. I loved your work and your blog! The lenticular boxes were a particular favourite.